My love of writing may have had its beginnings in real life when I began to write a journal but as far as my forays into fiction are concerned, I’ve never set out to recreate a character or an event that has been based on real life, not yet at least. But I can’t deny that there have been small elements of my real life that have managed to creep onto the page. It’s difficult to describe what’s going on inside a character’s mind without drawing upon some of my own ideas and influences so I suppose I have to accept that there is a little of me in some of my characters. Take Holly in Yesterday’s Sun for example. It’s no coincidence that I share her love of art. I grew up in a household where we all enjoyed drawing and painting, it was a hobby I shared with my brother and sister who continue to create amazing pieces of art while I’ve taken a creative detour into writing. When I had to decide what kind of career I wanted for my main character, making Holly an artist was a way for me to not only fulfil a lost ambition but to take my limited artistic talents to new, if somewhat imaginary heights. I had only ever played around with sketching and painting so it was quite liberating to suddenly start creating a huge sculpture if only in my mind’s eye. But my influences didn’t stop there. It might have been Holly who had the problem of producing a commission for Mrs Bronson but it was me who had to come up with the ideas on how to express the relationship between a mother and a child. That was less of a problem than you might imagine because some of those initial ideas she had existed long before I started writing Yesterday’s Sun. One sketch in particular was based on a drawing that takes pride of place on my living room wall. 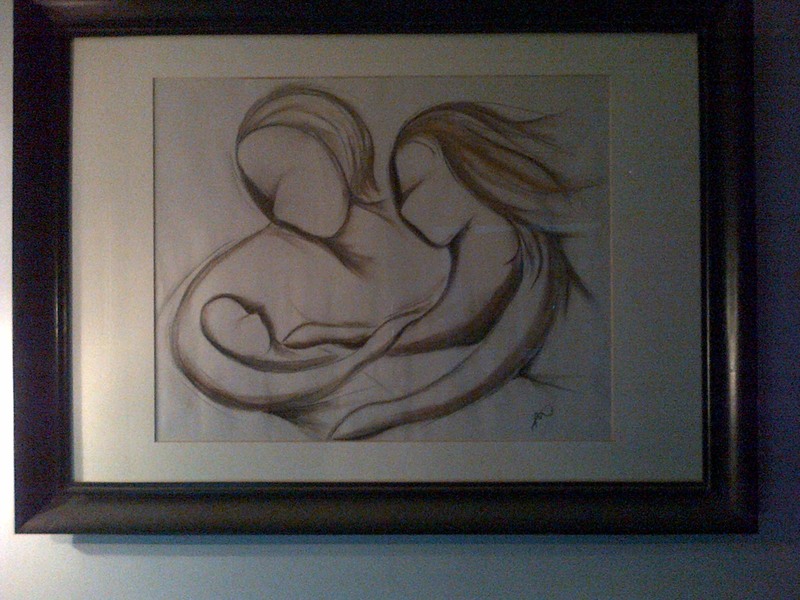 It’s a pastel sketch I drew shortly after Nathan was born and was meant to represent me with my two children. I would have to say that Holly’s sketches are far better than mine but that’s the joy of writing. I can describe a masterpiece without even picking up a pencil and I can create a magnificent sculpture of swirling figures curling ever upwards without having to take a chainsaw to a block of granite. And I’m very proud of the sculpture I’ve created, more so than the lump of broken rock I would have produced if I’d tackled it in real life! ← Who Loves Book Clubs?